World’s smallest inkjet image; more selective deposition; co-robot funding. ETH Zurich and Scrona have set the official world’s record for the smallest inkjet-printed color image. The feat, which has been recognized by the Guinness World Records, is based on Scrona’s so-called NanoDrip printing technology and quantum dots. 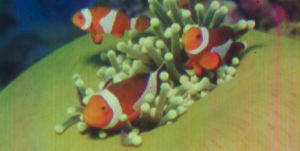 ETH and Scrona printed an image of clown fishes and sea anemones. The printed image measures 0.0092mm² in area, or 80µm x 115µm—which equates to about the cross-sectional area of a human hair. To see the image, officials must use a special microscope. To create the images using NanoDrip, layers of red, green and blue quantum dots were printed at high resolutions, according to researchers. NanoDrip is based on an electrically-stimulated droplet ejection technology, which enables sub-100nm printing. It is a non-contact technique, making it ideal for thin and flexible substrates. The technology could one day be used to print nanostructured materials in future electronics and displays. For years, the academic community has explored a novel technology called selective deposition. Combining novel chemistries with atomic layer deposition (ALD) or molecular layer deposition (MLD), selective deposition involves a process of depositing materials and films in exact places. Intel, for one, believes selective deposition represents a new paradigm shift for patterning at future nodes. It’s a technique that patterns chips from the bottom up at the atomic level. Researchers have been exploring different ways to enable selective deposition. The Eindhoven University of Technology, for example, has been developing two types of technologies in the arena–electron-beam induced deposition (EBID) and ion-beam induced deposition (IBID). Both technologies can be used in the emerging field of direct-write ALD, which, in turn, enables selective deposition. Georgia Institute of Technology is developing a new version of this technology, based on focused electron beam-induced deposition (FEBID). FEBID is a direct-write additive fabrication technique, but the technology some limitations. It suffers from slow throughputs and is limited in terms of precursors. In FEBID, an electron beam is used to deposit and pattern structures on a surface. In the flow, precursors are introduced in an electron microscope chamber. This, in turn, selectively deposits material on a surface. Georgia Tech has boosted the speeds of FEBID. In doing so, researchers have introduced electrically-charged liquid-phase precursors into the electron microscope chamber. Researchers used low volatility solvents such as ethylene glycol. They also dissolved silver in the liquid. The solvent contains material ions. The ions are introduced into the chamber using a nanoelectrospray system, based on a tiny nozzle. 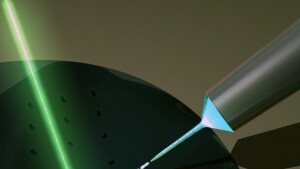 Then, a focused electric field is applied to the nozzle, which forms a controlled thin liquid film on a surface. The electrospray produces charged droplets at 100nm. A group of U.S. government agencies have announced $37 million in new awards to propel the development of co-robots. Co-robots are robots that work cooperatively with people in various manufacturing tasks. The new awards come from the following agencies–National Science Foundation (NSF); Department of Defense (DoD); Defense Advanced Research Projects Agency (DARPA); National Aeronautics and Space Administration (NASA); National Institutes of Health (NIH); and the United States Department of Agriculture (USDA). The awards represent the fourth round of funding through the National Robotics Initiative (NRI), which is a program launched in 2011. Co-robots could be used in various applications. For example, co-robots could be used to fix problems with unmanned space vehicles. They could be used in search-and-rescue operations and healthcare. “Our engineers and scientists are creating a world where robotic systems serve as trusted co-workers, co-inhabitants, co-explorers and co-defenders,” said Pramod Khargonekar, NSF’s assistant director for engineering, on the agency’s Web site.